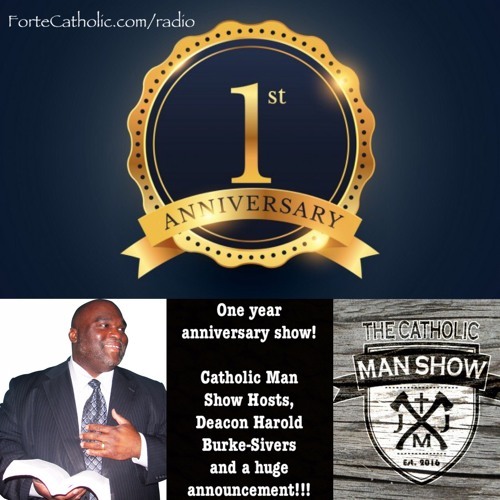 Forte Catholic Episode 51-One Year Anniversary, Catholic Man Show, Deacon Harold by Taylor Schroll-"Forte Catholic"
Huge show to celebrate the show's 1 year anniversary of going live on the air! First, we were joined by the fellas from the Catholic Man Show to settle who is manlier between them by pitting them against each other in a game of "Who Said It: Adele or King David?" Then we announce some BIG news together about the future of the show. In the second segment, I am joined by one of the best Catholic speakers alive, Deacon Harold Burke-Sivers. Tune in to hear how the Scriptures have made a huge difference in his life and how he wants to help the Scriptures come to life for you with his new book "Ignite: Read the Bible Like Never Before." In the final segment, we reminisce on our favorite moments in the show's first year. With stories from guest producers Kyle and Mckenzie, listeners on social media, and a special surprise guest, we recap the year's greatest moments. THANK YOU to all of you who have listened over the past year. This has truly been a dream come true and I am excited for what is coming in year two!